On the right hand side of my blogger page? I'm almost at 200 followers!!!! I swear, I shed a tear when I reached 100.. and now 200? I am also linking up with one of my fav bloggy friends, JIVEY! 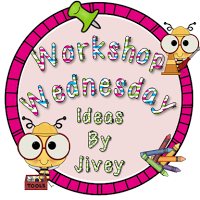 Workshop Wednesdays theme? Math Cards! I know I know, you are all thinking.. but she doesn't teach math?!?! I don't, but my fab partner and I love to support each other.. so when I have some free time or can fit it into Daily 5, I throw a little math in there! I use the division ones, A LOT because in fourth grade, they just don't seem to always grasp it! One of the ways I do this is to incorporate it with word work.. How you ask? Well, they know that every letter has a number. When they have finished their word work activity for the day (or sometimes this is the free choice) they can choose one of the packs. Once they have gotten an answer, they have to write the letter of the answer. For example, if their problem was 4x9=36, then they would write down C and F. Then, once they have 10 letters, they make a list of as many words as they can make out of their letters. I know it sounds complicated, but it works and they love it! You can order these at dollar tree online here or just go to your local store! 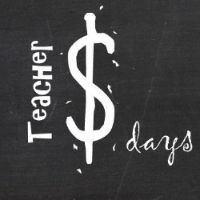 I'm also linking this up with A Teacher Without a Class: Dollar Days! I hit 200 this morning:) It's pretty cool! Sure, I'll help out! Congratulations on almost 200! I'll donate and item for you too. What a great way to combine math and word work skills. Genius!! I find division the hardest for my kids to pick up as well. Congratulations on the milestone - I'd be happy to help out. Love the idea of math cards with word work! Super fun! We'd love to donate an item! Congratulations! 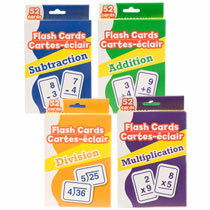 That is awesome that you do some flashcard work to integrate in your Daily 5! Love it! !